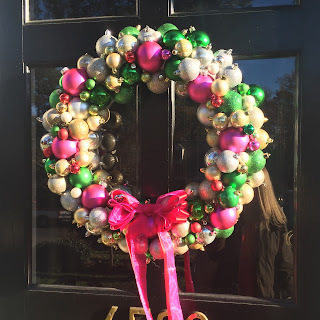 If you haven't gathered from my recent blog posts and Instas, I LOVE Christmastime! To me, it really is the most wonderful time of the year, and I love the spread of Christmas cheer all around! Over the years, I've posted a few Christmastime DIYs and ideas, and thought it might be nice to round them all up into one post, especially for my newer readers. I have always loved, loved, loved ornament wreaths. I think they are classic, while still being fun and definitely glam. Two years ago, I made an ornament wreath for our front door and posted the directions. Sadly, last spring, I knocked it down in the shed, and many ornaments broke. I made a new one last night and am so pleased with it! These wreaths are really easy to make, affordable, and only take about an hour. I stuck with the pink and green theme of my original, but added a few small red ornaments and also a bow this time around. I am very happy with these "upgrades". You can see the directions of how to make your own ornament wreath at the bottom of this post. When I was teaching, we always had a "Jingle Bell Run" on the last day of school before the holiday break. My firs year, a teacher friend and I made really cute jingle bell bows to wear. Since then, my bow has become a favorite accessory for holiday soirees and events, and I have made several as gifts for girlfriends. Directions for how to make this bow in under 5 minutes can be found in this post. With that same, crafty teacher friend, I also made a ribbon Christmas tree a few years ago. It was a really fun project and to this day, I am wishing that I had made 2 to have as a pair for decorating! Get the directions in this post. Last year, I hosted a Cookies & Cocktails party for my kindergarten team. It was a lot of fun and a great time to "escape" the stresses of school and just enjoy time together as a team. I am hoping to host a similar party for my new team this year...just need to nail down a date! To get inspiration to host your own Cookies & Cocktails party, and a recipe for a Peppermint White Russian, check out this post. What are some of your favorite Christmas DIYs or traditions? I am hoping to be back next week with a Christmas home tour. All our decorating is done, except for the tree. I am hosting book club tonight and would not have room for my guests and a tree in the living room, so we are hoping to move our tree inside and decorate it this weekend! I am also hoping to get my Stocking Stuffer Gift Guides done by the end of next week. Each guide takes about an hour, so between the Ladies & Gents guides, I've already put in 10+ hours and needed a bit of a break! Check those guides out here and here. What fun ways to get in the Christmas spirit and get your house ready for the holidays! I love these ideas!